You may have noticed that it’s starting to get cold outside and find yourself hustling to get to the warmth of home and even work! This post will focus on how we generate heat for buildings and how we can save energy in heating plants. The primary component of a building heating system is a boiler plant, typically a group of two or more boilers. A boiler is a closed vessel in which water or another fluid (such as glycol) is heated, either producing steam or hot water/glycol. Various fuels can be used in boilers, including natural gas, oil, biomass, coal, nuclear fission, etc. Boilers at UHN facilities typically burn natural gas, with oil acting as a backup fuel source in case of disruption to the gas supply. Hot water from a boiler plant can be used in air handling unit heating coils, radiators, and domestic water heaters. Glycol is typically added to heating boiler water when there is a risk of freezing in air handling units. Steam boilers can serve many of the same loads as hot water boilers, but can also tackle process loads, such as sterilization and humidification. 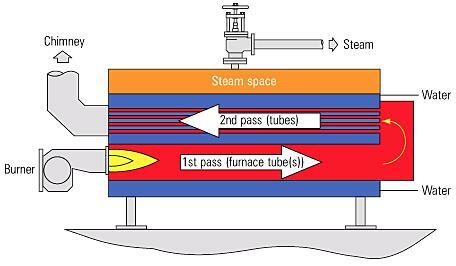 The figure below shows a simplified example of a firetube steam boiler with two hot gas passes. Steam is generated as the hot combustion gases from the burner pass through tubes in a vessel containing water. I won’t get into all the semantics of boiler design, control, and operation, but just aim to touch on a few ways to save energy in a boiler plant. The number one rule of energy conservation is to eliminate waste before implementing a bunch of fancy new technology to improve efficiency. This means conducting steam audits looking for leaks, maintaining steam traps, insulating pipes, turning off or setting back unnecessary heating equipment, minimizing exhaust of conditioned air, etc. The efficiency of a boiler is in part dictated by the number of “passes” the hot combustion gases make through the heating fluid before being exhausted through the stack. The longer the combustion gases contact the heating fluid, the more energy is removed and the lower the flue gas temperature will be. Boilers with 4 passes or more tend to have the highest efficiencies. Some boilers are designed to extract so much heat from the combustion gases that the temperature of the flue gases drop below the dew point temperature and water begins to condense. This is typically achieved by using the flue gasses to pre-heat incoming makeup water. These boilers are specifically designed to handle corrosive condensate from the flue gases and have a price premium over non-condensing boilers. Condensing boilers can achieve efficiencies of over 90%, so the added investment can be worthwhile. Combustion efficiency is dependent on the fuel-to-air ratio during combustion. If you add too much oxygen, excess heat will be taken up the stack. Not enough oxygen leads to partial combustion, wasting fuel. Most burners have a common drive motor with a series of mechanical linkages connecting the fuel valve and the air damper to maintain the fuel-to-air ratio (see photo). These linkages work, but have little flexibility to provide control throughout the firing range and can be flimsy, causing them to quickly go out of calibration. A linkageless burner has two independent drive motors actuating the fuel and air valves, controlled by a microprocessor based on continuous oxygen, CO, and CO2 readings. These systems have the capability of recording and optimizing operating conditions over time and maintaining a minimum level of excess oxygen. Up to 15% gas savings can be achieved by moving to a linkageless burner control system. For hot water boilers that primarily serve heating loads, efficiency can be gained by reducing the temperature of the hot water being generated. During a warm fall/winter day, a heating coil may not need 180F water to meet the space temperature demands. A linear schedule is typically used specifying the boiler water temperature based on the outside air temperature reading, with a specified minimum boiler water temperature setpoint. With an existing boiler plant it is important to ensure that the boiler return water temperature is not reduced to the point of condensing combustion gasses in the boiler. A boiler that is not designed for condensation can be damaged by corrosion. In steam boilers, precipitates and impurities dissolved in the feed water are left behind after the boiling process. These impurities build up over time and need to be removed periodically to avoid sludge build up and boiler damage. Typically, the built up material is removed through a surface blowdown (removing film from the water surface) and a bottom blowdown (removing sludge from the bottom of the vessel). 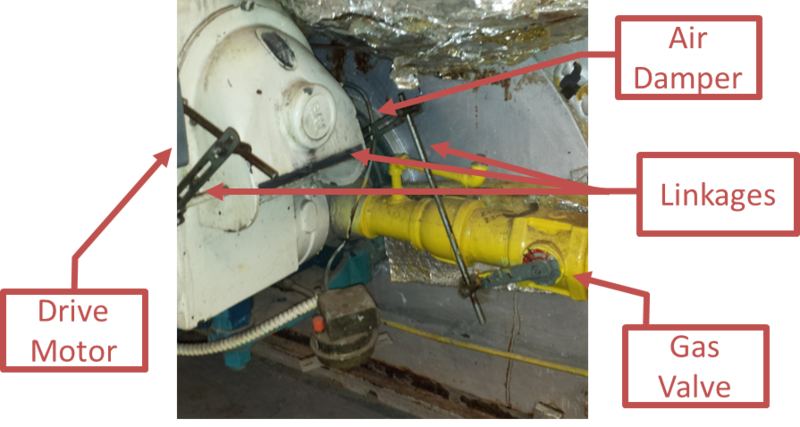 Often, these processes are done manually once per shift or based on observed boiler conditions. However, each time the blowdown is done, a great deal of heat is sent down the drain. Controllers are available that continuously monitor boiler water conductivity and automatically initiate a blowdown cycle when conditions dictate. This can reduce the number of blowdown cycles to the minimum required and thus reduce the amount of heat sent down the drain. Efficiency can be achieved by attempting to recover usable heat from both flue gases and boiler blowdown water. Heat recovery can range from a simple heat exchanger in the blowdown water tank to tightly controlled flue gas condensing recovery systems. A system that recovers heat from flue gases and transfers it to boiler feedwater is typically called an economizer. UHN is currently developing a replacement for the existing steam boilers at the Bickle Centre. The boilers are not very large, so some of the above technologies are not appropriate economically. Features that are being targeted include: downsizing the boilers to meet current loads, specifying the highest efficiency units for the project requirements, mandating the use of linkageless controls, and studying the potential for automatic blowdown controls and an economizer system. This entry was posted in Beyond Talkin' Trash, Energy Stories (powerful stuff), What We're Working On. Bookmark the permalink.